“Never tell a soldier that he does not know the cost of war,” says Alan Rickman’s character in the closing moments of Eye In The Sky, and it is a line that will not only be remembered as one of the actor’s final few words uttered on-screen before his untimely death earlier this year, but also as the chilling punchline to a film where absolutely none of the soldiers shown on-screen are ever seen in physical combat, or even getting up out of their chairs. It perfectly sums up how Orwellian modern warfare has become, with remote-operated drones and cameras disguised as wild animals being used by military forces to spy on any kind of suspicious activity, instead of physically deploying soldiers to do the same thing. But no matter what, it’s always going to come down to a simple choice: do you pull the trigger, or not? That choice is central to director Gavin Hood’s fascinating and incomprehensibly intelligent thriller, which excels at providing a fair and balanced perspective from both sides of the argument whilst never letting the debate bog down the sheer intensity of the on-screen situation. Rickman’s Liteutenant General watches from a conference room alongside a small group of politicians the mission that Helen Mirren’s Colonel Katherine Powell is heading to capture a group of Al-Shabaab extremists, including a few radicalised British and American citizens, who are meeting in a safe house in Nairobi, Kenya. She enlists two Nevada-based drone pilots (Aaron Paul and Phoebe Fox) to survey the scene as well as a Kenyan undercover agent (Barkhad Abdi) to get a closer look inside the house. However, when it soon becomes apparent that the extremists are preparing explosives and targeting civilians, the mission is altered from “capture” to “kill” – which is soon made far more difficult by the unexpected appearance of a young girl (Aisha Takow) selling bread right in the kill zone. This sparks the debate that carries on through the whole film, whether or not it’s right to proceed with the mission and risk the child being caught in the crossfire. It’s an argument that is looked at from all angles, from a political standpoint to how it could be used as propaganda by other extremists, but it is a decision that needs to be made as quickly and as sufficiently as possible before the terrorists can carry out their own attack, so there is unbelievable pressure from each and every person involved to reach a decision that will ultimately decide the fate of the innocent young bystander. The final decision, which of course we’ll refrain from detailing here, is one that will haunt you as much as it clearly does those affected by it on-screen, and what Hood does here that is absolutely ingenious is that it makes you feel pity for the eventual outcome yet completely understand the reasoning behind it. This is the kind of film that needs to present a clear and uncomplicated scenario for the audience to insert themselves into, directly asking them what they would do if they were in this situation, while allowing them to also familiarise themselves with both sides of the argument instead of honing in on just one. Both Hood and writer Guy Hibbert manage to accomplish this through some incredibly thoughtful and provocative dialogue that details all the valid points without sounding like it’s been copy-and-pasted from a legal document, and by keeping things afloat with the right amount of suspense and character-driven moments that are just enough to keep us invested. It is easily Hood’s strongest film since Tsotsi, for which the South African filmmaker won an Oscar ten years ago, as he directs scenes with enough masterful tension and steady competence to make us forget he also directed X-Men Origins: Wolverine (to be fair, though, that one was far more the studio’s fault than it was Hood’s), and gives his actors some great scenes to work off of, whether they be in scenes of peril and desperation or even little things that make their characters human (Iain Glen’s foreign secretary gets food poisoning while in Singapore, while Rickman is seen trying to pick out a doll for his granddaughter’s birthday before heading to work). But while everyone in the cast does great work here, it really is Rickman’s presence that stands out the most; watching him perform in this movie serves as a great reminder of how big a talent the man truly was, and even when you remove that fact he still gives a committed and thorough performance that ranks amongst the best he’s given in recent years. Thankfully, this movie is far more than merely the final on-screen appearance of Alan Rickman (or second-to-last if you count his role in the forthcoming Alice Through The Looking Glass); it is a compelling, thought-provoking and effortlessly cerebral film about war and the endless debates that stem from it, especially in today’s environment. It features some of the most intense and suspenseful direction you’ll see in a while, as well as some of the most on-point writing and acting, and will undoubtedly inspire debate amongst many audiences about their own opinions on the art of modern warfare, a debate that is increasingly becoming more and more relevant with every passing international incident. For every sense and purpose, Eye In The Sky is unmissable entertainment. Do your best to catch it before it leaves cinemas, as you will unlikely experience a more intelligent piece of filmmaking this year. 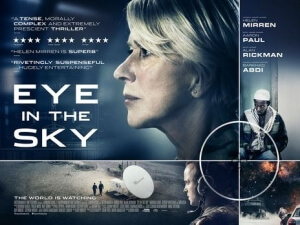 Eye In The Sky is one of the best films about modern drone warfare we’ve seen, presenting a clear and balanced debate about what is politically and ethically right while never letting it drag the film down thanks to some suspenseful direction, intelligent writing and strong acting by a great cast including the late, great Alan Rickman. Please do not miss this film.